Today, I reached a destination that I have wanted to see since I was a small child. Anyone who knows me knows how I feel about being a Marine and the United States Marine Corps. 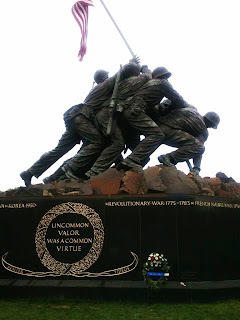 The Marine Corps War Memorial is something I wanted to see, it is part of my bucket list. I got to check that box today. To stand next to the memorial placed me in awe. It was more than I ever imagined. As I stood back in humble admiration I listened as people talked about how it was the most impressive monument in D.C. I told one gentlemen, "If you find it impressive, you should be a Marine and be here." The monument is there to pay respect to the all of the dead of the United States Marine Corps. It depicts the flag raising on Mount Suribachi during World War II. The statue was dedicated by President Eisenhower on November 10, 1954, the 179th anniversary of the Marine Corps. This is proudly the picture of the day. Semper Fidelis and good night Chesty Puller where ever you are. Oooooh Raaaahhhhh!!!! Great picture. Cant wait to visit D.C. and that monument as well. As a former Marine myself, I am sure that there is a slight aura or presence with just being next to that thing.